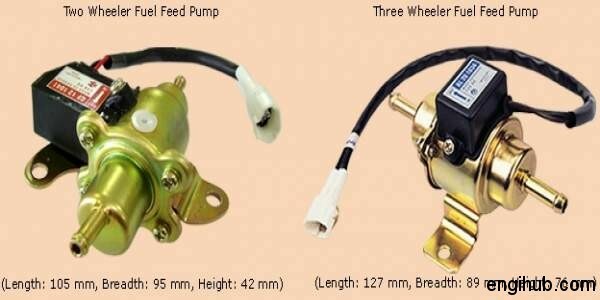 Fuel feed pump delivers the fuel from the tank to the injection pump continuously and at a reasonable pressure.The fuel injection system also contains following important components, which are useful in engineering. Out of above components, you will get detail about Fuel Feed Pump in this article. The fuel which is stored in fuel storage tank is taken to injection system through fuel filters. This fuel, either by gravity or by mechanical pressure is supplied to the injection system. 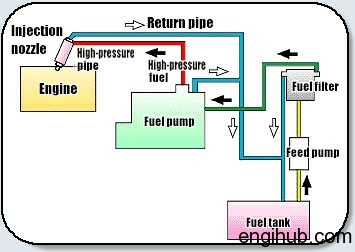 The fuel starts flowing to the injection pump under gravity head as the fuel tank is placed at a higher level than an engine in gravitation feed system. Hence this type of arrangement is most suitable for stationary engines. In mechanical pressure system, the fuel is sucked from the fuel tank by a mechanically operated fuel feed pump and is forced to the fuel injection pump. In this case, a fuel tank is placed away from an engine or at a lower level than the engine. This system is most useful for automobiles using diesel as fuel. Because the fuel placed away from the hot engine avoids the chances of fire hazards. A plunger arrangement is fitted in a pressure chamber. So, the plunger is activated downward by a cam through a roller tappet and plunger rod. On the opposite side of a plunger, a plunger spring is employed; hence the return stroke of the plunger is performed. The fuel is led to the plunger space through suction valve and after getting compressed, the fuel moves out through pressure valve into the pressure chamber from where it goes to the filter and then to the fuel injection pump. To avoid the wastage of fuel, a leakage channel is provided, so it collects heated fuel from the stuffing box and feeds it again to the inlet pipe. During the upward stroke of the plunger, suction is created in plunger space and fuel is sucked in, through suction valve. During the downward stroke, caused by a cam arrangement, the fuel below the plunger is compressed, which forces the suction valve to close and pressure valve (Outlet valve) to open. The fuel thus flows out under pressure1 kilogram/cm² into the pressure chamber. The construction and working of fuel feed pump are so easy that anyone can understand it easily.